Gissurarson giving his lecture in Torshavn. Photo: Heinesen. 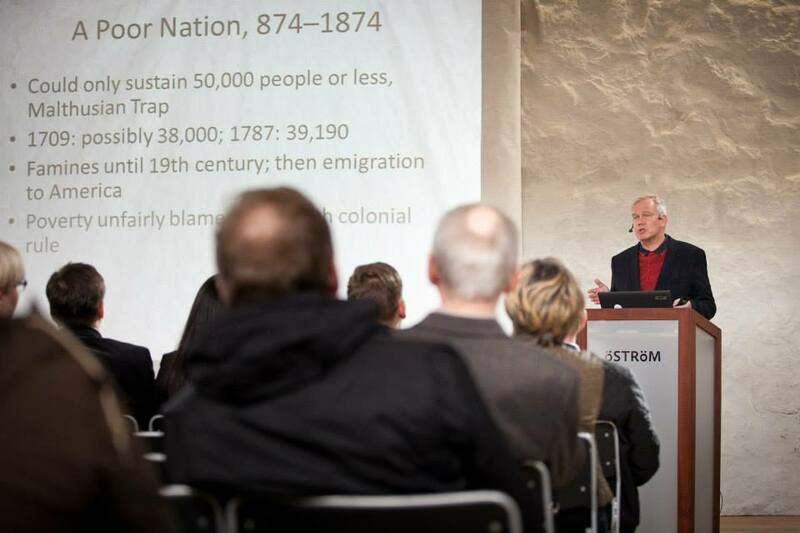 The smallness of nations can be an opportunity as well as a constraint, Professor Hannes H. Gissurarson, RNH’s Academic Director, said at a meeting of the political association Framsokn in the Faroe Islands, in Ostrom House in Torshavn, 22 March 2014. 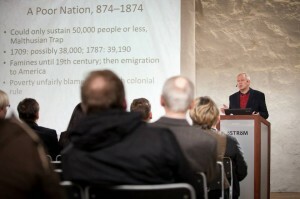 In his lecture, Professor Gissurarson gave a brief analysis of Iceland’s history. In a Malthusian trap for centuries, the population never reached more than 50,000: a few wealthy farmers, backed by the Danish king, hindered the development of the Icelandic fisheries, the only sector of the economy with any growth potential. Until 1940, living standards in Iceland were only half as good as in Denmark. From then on and until the last decade of the 20th Century, the Icelanders enjoyed a partly spurious prosperity: they profited both from the hot and the cold war, those of 1939–45 and 1948–89; they increased their resource base dramatically in four extensions of the fisheries zone, driving out foreigners (who had previously harvested half of the total in the Icelandic waters); and they over-exploited the fish stocks, first the herring stock, which even disappeared for a while from the Icelandic waters, and then the cod stock. Then, in 1991 they changed course. A new government ceased to subsidize unprofitable enterprises, inflation was brought under control, the government deficit was turned into a surplus, the public debt was reduced and almost disappeared, government enterprises were privatised, taxes were cut, the sustainable and profitable system of ITQs (individual transferable quotas) in fisheries was developed further and pension funds were greatly strengthened. 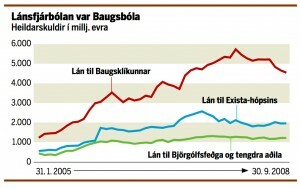 Red line shows loans to Johannesson and his cronies. However, another and less fortunate turnabout took place in 2004 when a small group under the leadership of retail magnate Jon Asgeir Johannesson became very powerful in Iceland. Crony capitalism replaced the market capitalism of the 1991–2004 era. 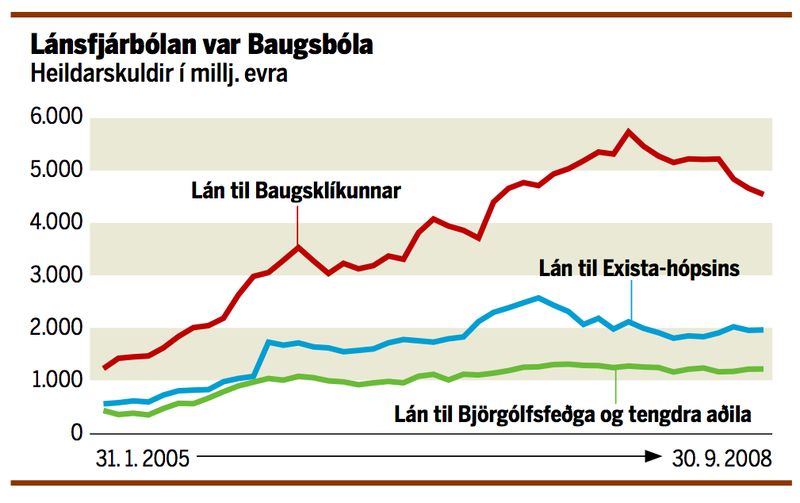 Professor Gissurarson presented a graph with data from the report of the SIC, Special Investigation Commission into the bank collapse, showing that it was Johannesson and his cronies who were responsible for most of the debt accumulation in the banks before the collapse, much more so than the two other main business groups identified by the SIC. Thus, because of company cross-ownership and overvalued debtor assets, a systemic risk specific to the Icelandic financial sector was created, in addition to another systemic risk caused by the asymmetry of the banks’ field of operations—the whole of the European Economic Area—and their area of institutional support—which turned out in the end to be Iceland alone. In the autumn of 2008, three decisions made in New York and London transformed this already fragile and vulnerable situation: The US Fed refused to make a dollar swap deal with the Central Bank of Iceland, similar to those which it had made with the Scandinavian central banks; the British government refused to allow British banks owned by Icelanders to participate in the financial rescue programme for British banks; and the British government invoked an anti-terrorism law against one of the Icelandic banks, Landsbanki, as well as the Central Bank of Iceland and the Icelandic Financial Supervisory Authority, with the result that a total collapse of the banking sector became inevitable. The 2008 bank collapse caused a sharp leftward swing in Iceland, mostly however reversed in the 2013 parliamentary elections. But the bank collapse demonstrated, Professor Gissurarson submitted, that it was difficult for small nations to be without powerful allies. Despite little interest in Iceland both in the US and in the UK, these two powers remain, with Canada, Iceland’s most natural allies, Gissurarson argued. No shelter is to be had in the EU, as the example of Cyprus showed. However, small nations have first and foremost to rely on themselves; they have to utilise their natural resources efficiently, to keep taxation at a moderate level and to facilitate wealth creation. Professor Gissurarson’s lecture formed a part of the joint research project of RNH and AECR, the Alliance of European Conservatives and Reformists, on “Europe, Iceland and the Future of Capitalism”.